Pure has announced a pair of plug-in-and-play digital car radios, which will let drivers receive digital radio without the additional cost of installations. The Highway 400 and 600 sit on the dashboard and connect to the stereo system either through auxiliary input or through the FM transmitter. You'll then have access to both digital radio and music streaming services, although you'll also need the companion Pure Go app if you want to use the latter. Pure has partnered with Spotify for the radios to add additional features, which includes being able to 'tag' tracks on the go by holding down a button on the radio. - Those tracks are then added to a Pure Go Spotify playlist. The radios fit easily to the dashboard, but you'll also have to fit an antenna to the windscreen, and there's a bit of cabling that will need to be fixed down. The 400 and 600 will be priced at £129.99 and £149.99, available from April and sold exclusively through Halfords, but are only differentiated by one feature. The 600 comes with hands-free calling, which the 400 lacks. However you'll be able to access Siri and Android's "Ok Google" personal assistant (depending on which phone you have connected, of course) on both - helpful for checking weather forecasts and all that lovely stuff. 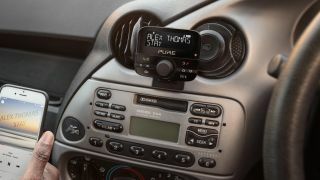 The new radios are being announced alongside a huge push in digital radio. This week the Secretary of State for Culture, Media and Sport, John Wittingdale, "switched on" the UK's second DAB digital radio multiplex network. The new network will feature 18 stations, 11 of which are already on-air - the rest will launch by the end of March. Right now, digital radio accounts for nearly 20% of all in-car listening.